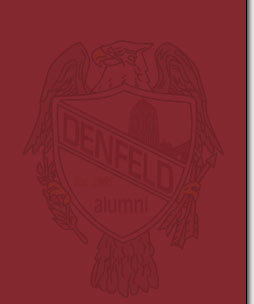 The Denfeld Alumni Association formed in the spring of 2004 and was established on Feb. 9, 2005, as a Minnesota nonprofit public charity under sections 501 (c) (3) and 509 (a) (2) of the Internal Revenue Code. Its ongoing mission is to sustain alumni relations and celebrate the spirit of Denfeld High School and western Duluth. Denfeld originally established an alumni association in 1919. It is not known what became of that organization, but at some point it dissolved. The 1922 Denfeld Oracle notes that "it softens the pangs of leaving Denfeld forever when you know there is some way to live a part of those days and experience the same school friendship once again. So when you reach the end of the Denfeld path, take the side path adjoining which leads you to a friendly haven, the Denfeld Alumni Association."